So begins the brief label that hangs next to Gentile da Fabriano’s painting on wood, The Coronation of the Virgin, at the Getty Center. The sentence says a lot, but it also raises a frequently asked question: What was on the other side? I took the question to Davide Gasparotto, the Getty Museum’s senior curator of paintings. Turns out, the other side of our panel once bore another painting, also by Gentile: St. Francis Receiving the Stigmata. That artwork now belongs to the Magnani Rocca Foundation, a private collection outside of Parma, Italy, which is open to the public. Davide says there are plans to update our painting’s label with this information, including a small image of St. Francis Receiving the Stigmata. That answers that. But it’s funny how finding out the answer to one question just raises other questions. Like: Why a painting of St. Francis? Is one side of a double-sided standard considered the “front”? And, why were the paintings separated in the first place? So, I sought out some more answers. Why Was a Painting of St. Francis on the Other Side of The Coronation of the Virgin? The subject on the back of The Coronation can be explained by who commissioned the processional standard. Either Franciscan monks in Fabriano, Italy, or a confraternity of their supporters contracted with Gentile—at the height of his career one of the most celebrated Italian painters of the early 15th century—to make it when he was visiting his hometown about 1420. The commissioning group probably came through the church of San Francesco (St. Francis) in Fabriano, where the paintings were held into the early 1800s. 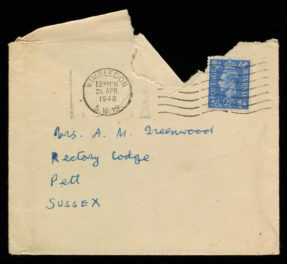 Most likely it was the religious confraternity that commissioned the standard. Such organizations were common features of life in the Middle Ages and Renaissance. Laypeople prayed together and carried out acts of devotion and charity, such as sponsoring masses, conducting burial rites for the citizenry, and commissioning music and art. In the case of The Coronation, the group was probably made up of devotees of the Virgin Mary who would have carried this standard on her feast days. In 15th-century Italy, so-called processional standards—often double-sided panels with religious images—were among the assortment of objects carried in Catholic processions. They were affixed to a pole and carried above crowds. 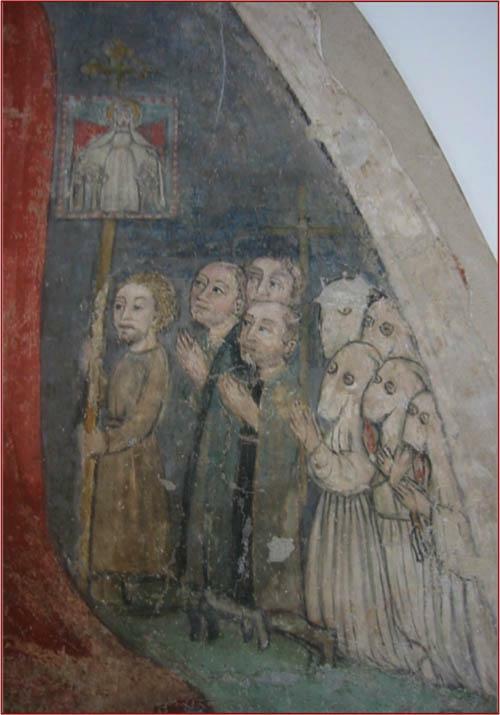 A scene from a detached, 15th-century fresco gives us a glimpse of how this might have looked, showing a kneeling man amongst other kneeling men and confraternity members holding up a standard depicting the Madonna of Mercy. At the time, many terms were used for these standards. But Getty paintings conservator Sue Ann Chui told me that the Italian word segno was used specifically “to describe an object that consists of a pole surmounted by a depiction directly related to the organization to which it belongs” (see this article for details). Standards were designed to be seen from both sides: The painting on one side would honor significant events in Christian teaching, and the painting on the other side would contain a symbol promoting the confraternity that had paid for the segno. Which Side Is the Front? A two-sided standard probably didn’t have a permanent “front.” Instead, the front depended on context. The Coronation/St. Francis could have been carried on feast days for the Virgin and for St. Francis. The confraternity might have carried the relevant side forward based on who was being primarily celebrated. Why Were the Paintings Separated? 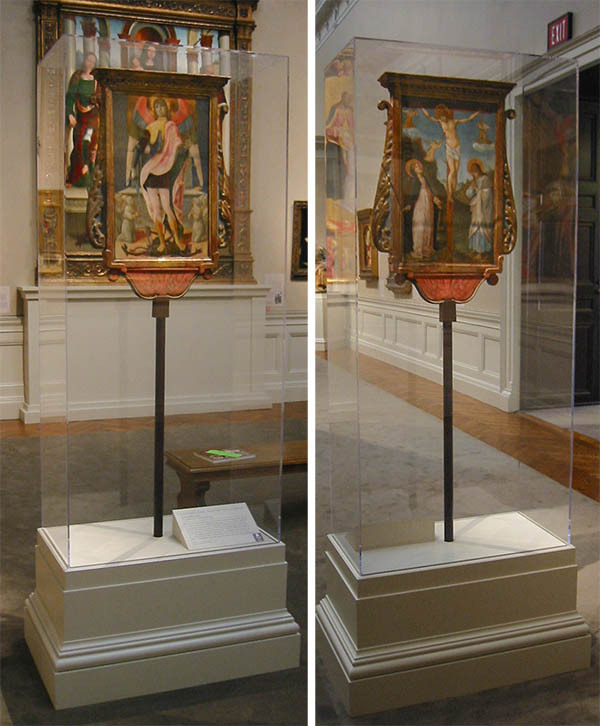 We do know it’s rare for a two-sided standard from Renaissance or early modern Europe to have survived intact. 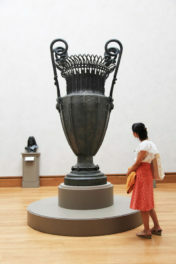 As portable artworks they were moved often, which invites damage. 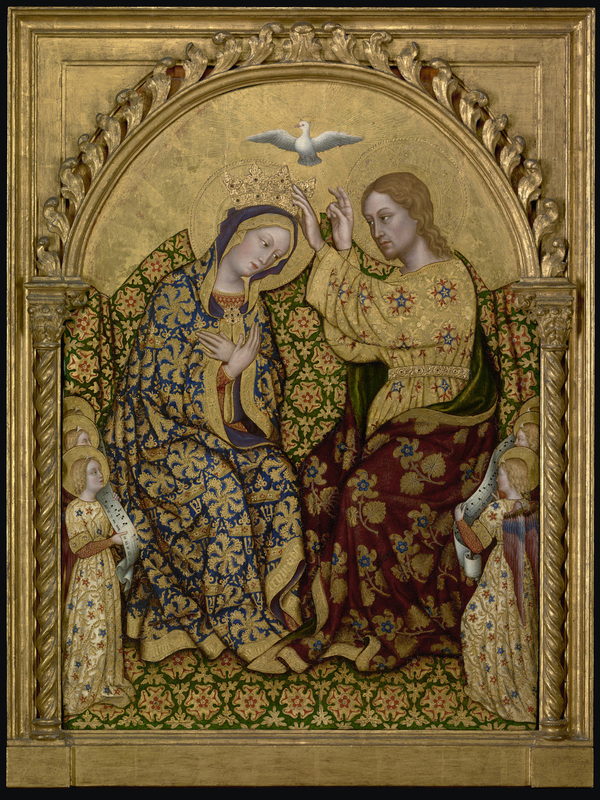 The best-preserved example in the United States, according to Sue Ann, is in the collection of the Walters Art Museum in Baltimore and is the work of Lorenzo d’Alessandro, another 15th-century painter who, like Gentile, was from the Italian region of the Marche. All in all, while we don’t have definitive proof of what happened to the other side of Gentile’s The Coronation, it was probably split in half to make two panel paintings out of one. Got your own questions? Join us for #AskACurator Day on Twitter this September 14—or leave me a comment! And explore answers to more art questions in our #QuestFest series on The Iris. Very interesting. We know how to detach a buen fresco from the wall but in this case how did they actually divide them. 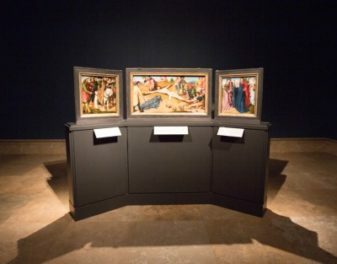 I guess one possibility would have been sawing into the panel–gently and carefully (in between the two paintings)–or were there originally two panels the same size and they opened up the frame and took one out?